"I'm starting to get into pretty good shape right now. I'm back in the mountains at elevation, a place I love, a place where everything clicks for me and I really feel like my body is just absorbing all the training like a sponge. I'm seeing improvement from week to week and am feeling better and better with more and more snap in my legs and just really building a nice momentum right now." - Ryan Hall in his teleconference discussing his preparations for his fall marathon, the ING NYC Marathon. LetsRun.com's co-founder Robert Johnson gives his take on Hall's preparations at the link above. Could Asbel Kiprop Pull The Double 8/15 in Berlin?? Did You Look Forward to Your Wedding? What do you think of Symmonds 3rd? Progression of World Records seems to be screeching to a halt. LRC: Aviva London Day 2 Recap We've got very event and every result recapped for you. Tyson Gay got a win but injury worries surfaced afterwards. Usain Bolt and Yohan Blake led Jamaica to a ridiculous 37.46 clocking in the 4x100m. In the distances, Tirunesh Dibaba returned with a 14:33 while America dominated the 1500m and mile as the men went 1-2-3 and Anna Willard took down Rowbury in a fun 1500m. Read our recaps for our take on the results. *Bolt Wins 100m In A Canter 9.91 blowout into a blowing wind. *Aviva London Day 1 Results We think our readers crashed the Aviva London site. Kenyans Want To Crush Ethiopians Coach Julius Kirwa "One of my main targets in Berlin is to get the men’s 5,000m and 10,000m gold medals which I believe we can easily win. Bekele and Ethiopians are tough but we can do it." After an uber-successful 2008 olympic games the Kenyans are feeling the pressure to do even better in Berlin. Soon we'll know what the whole team looks like as their trials are this weekend." Plot to Put Ethiopians in Their Place “I believe this time we will break the dominance of our Ethiopian rival, Bekele. I know his reign is coming to an end soon. I respect Bekele. He has done a great job and we admire him. But one day I will beat him.” Kenyan 10,000m guy Mark Kiptoo. *Bolt: "I would say I'm faster than Tyson Gay and I'm trying to stay that way." Bolt also reveals that he plays Call of Duty: Modern Warfare under a pseudonym for hours a day. *Bolt On What He Thought About One Newspaper Saying He Was Scared of Tyson Gay And Avoiding Him "Is that what they're saying? That's definitely not true. I've never been scared of anybody in my life and I've never backed down from any challenge put in front of me." *Bolt on His Fitness & Preparations For Berlin: "I think I'm probably close, probably 85 percent." Not Again! Tyson Gay Rumors Confirmed: He's Injured - But This Time Not Seriously Track and Field News has the scoop from agent Mark Wetmore, who extinguished some of the flames by saying Gay will compete this weekend in London and should be fine. Doug Logan Writes An Excellent Piece About The Nicole Bush USATF Steeple Saga We've got to hand it to USATF CEO Doug Logan. Either he's really good at seeming like a really good guy, or he actually is a really good guy. Read this blog about cowardly USATF/Eugene officials and administrators, Nicole Bush and a steeple barrier that was 20% too high at nationals and decide for yourself. Ryan Hall Running New York City Marathon We've mentioned this before, but it deserves its own headline. Tenacious NYRR CEO and ING NYC Marathon Director Mary Wittenberg couldn't nail down the best marathoner on the planet Sam Wanjiru, but she got a better domestic publicity package in the form of American marathon star Ryan Hall, who will follow his Beantown performance with a race through the 5 Boroughs of the Big Apple in November. Hopefully he'll race 2-Time Champ Marilson Gomes Dos Santos to settle who is the best non-African marathoner in the world (sorry, Viktor Röthlin). Extensive Update On The Rupp-Ritz Pairing In Portland Is it just us, or is this pairing a LRC Message Board dream? The only thing better would be Rupp and Alan Webb training together, with a little Evan Jager on the side. 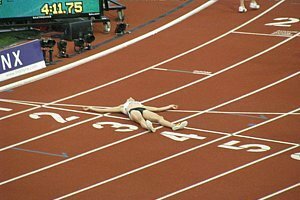 LRC: Alan Webb's 2009 Season Appears To Be Over Two years to the day after Alan Webb set a new American record in the mile, LetsRun.com has learned from Webb's agent, Ray Flynn, that Webb's 2009 season is likely finished before it really even got going. No European races for Webb in 2009. Wanjiru To Run Chicago If any of you thought the Bank of America Chicago Marathon was on the decline with Bank of America owning it and the financial mess we're in, think again. 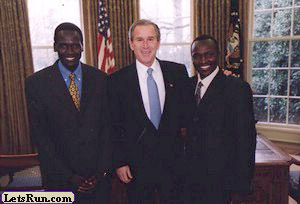 They signed up the World's top marathoner, Sammy Wanjiru, on Tuesday. They already announced Deena Kastor. It is expected Ryan Hall will be running NY in the fall. Duncan Kibet and Haile Gebrselassie will square off in Berlin. LRC's Take On Ryan Hall's NYC Marathon Teleconference LetsRun.com Co-founder Rojo asks America's top marathoner how he recovered from Boston and how his training is going. We try to give you a bit of analysis as Hall continues to prepare to win his second straight marathon in the Big Apple. LRC Boards: Meb and Molly Huddle Win US Titles The veteran Meb dominated, gapping Fam and the rest by 30 seconds. Quad-City Times Bix 7 Preview Some quotes from Fam, Meb and Carney. Results coming soon. Yohan Blake Gets The Bad News: It's You! Teenage sensation Yohan Blake, second in the Aviva 100m to Bolt on Friday, learned later that day that he was one of the 5 Jamaicans to have tested positive for a "minor substance" at the Jamaican champs. Not Good ... 5 Jamaican Sprinters Have Tested Positive Now the word is "it's not a big deal", as the competitors tested positive for something in a supplement they bought at the trials. Uhhh, okay. Russian Alminova Sets World Best 800m Time In Russian Trials 1:57 for Alminova just a few days after many of her former teammates were banned for almost 3 years. Kaki Is Back! Wins Rainy 1000m In 2:20 - Karlstad, Sweden It's good to see Kaki back from what looked like a bad injury a few weeks back. *Ryan Hall's NYC Announcement Hall is also running the NYC Half in August. Asics must be loving this plan! *LA Marathon Moves Back To March The LA Marathon was one of the most amazing races we've seen this year as Louisville grad Wesley Korir ran 2:08 and won almost 200,000 dollars. *Strange Article On Asbel Kiprop Hoping To Become A Top Miler Someone should tell the journalist that Kiprop is now the Olympic gold medal winner. *Kenyan Drama Set To Begin: "We'd Rather Take 20 Athletes Who Can Win 20 Medals Than 50 Athletes To Win 1." This meet should be live on the internet. Flotrack, are you going to be in Kenya this weekend? *800 Meters To Highlight Kenyan Trials As David Rudisha And World Champ Alfred Kirwa To Clash For 1st Time Ever Rudisha missed last year's trials with injury. *Pamela Jelimo Said An Injury In December Set Her Back Two Months But She's Feeling Good Now We're glad to see she's confident. That being said, we don't believe her when she said the following about her early season disastrous results. It might be the lie of the year: "To many, I was running badly, but to me it was just a normal training exercise. I took the results positively because I was just coming into competitive action." Apparently, she didn't believe herself as in this article, she admits her early season poor runs were "very painful." 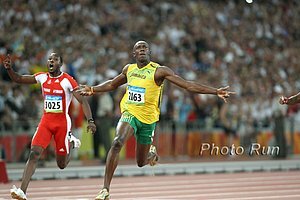 Bolt Starting To Understand His Importance - Hints That He Can Save Track And Field Can any one person "save track and field"? Track, maybe. Field? No chance. Bolt sure is doing a good job at filling seats around the world. Word is Crystal Palace is sold out for 2 days for the chance to see Bolt. *Usain Bolt Holding Out On Signing Diamond League Contract Meet Director Dilemma: say you pay only Bolt and nobody else. The stands will be packed but the other events won't be that great. You'll be slammed in the media. This is why Bolt can't save track and field. Track and field needs like 20 Bolts. Runner's Tribe Interviews Top Young Distance Runner, NAU's Aussie David McNeill McNeill, runner-up to Rupp at the NCAA 5k, looks to be on his way to becoming a 27-mid, 13-low guy. Top-Flight Italian Cyclist Banned For CERA Science of Sport asks: How could a pro endurance athlete be dumb enough to continue to take CERA? 7 Russian Women Dopers Slammed With Extended Suspension These cheats and their coaches, managers and doctors who still won't admit they were switching urine despite irrefutable DNA evidence - along with dozens of other cheats - will still probably be back in the Golden League before Dwain Chambers. Don't admit to cheating and they'll take you back. Hey, at least it's better than baseball. Linford Christie's Niece Becomes First Ever Black Miss England In Controversial Decision This gem comes from the British tabloids (which we read for some reason). Rachel Christie is a UK heptathlete and now a competitior for Miss World or Miss Galaxy or whatever. Apparently she won with only 9 votes from the public - ranking her 49th in the public's eye - but the professional judges loved her and voted her through. IAAF Previews London's Aviva Grand Prix We are only putting this up because it has to be one of the most inadequate previews for a major event that we have ever seen. First of all, it only mentions 2 events in a 2-day meet and second, the grammar is awful. If we care about one thing at LetsRun, it's grammar. Note to sports journalism majors: IAAF online hiring new writers/editors soon. It's Official: #1 vs. #2 All-Time Is Happening In Berlin: Duncan Kibet To Challenge Haile Gebrselassie Fans had long been hoping for a Wanjiru vs. Geb showing at Berlin. Well they'll have to settle for the #1- versus #2-fastest of all time, as Wanjiru is going to Chicago. 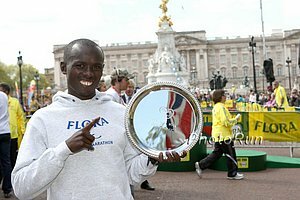 It's Official: Willis Out Of World Champs He's up to running an hour a day, 5 times a week, preparing for 5th Avenue Mile. *After Failing In Bid To Move Up To 5k/10k, Ethiopia's Yakob Jarso Qualifies For Worlds In 1st Steeple Of Year We're not sure why someone who was 4th in the Olympics would try to change events. He runs for Team Honda in Japan. *Campbell-Brown Responding Well To Treatment, Should Be Ready For Worlds The 100m world champ skipped a meet in Greece after suffering a cramp but seems to be fine. In the meantime, Jamaican Kerron Stewart has distanced herself from the rest and is on a total roll. LRC's Heusden Distance Recap *Results *LRC Thread Matt Tegenkamp got his A standard in the 5,000m with a smooth 13:07.97 2nd-place finish that boosted Evan Jager onto the USA Worlds 5,000m squad. Teg is officially back in top form with his fastest time since 2007. Bad Car Crash After Jorge's Wedding In CO Leaves Coach Fedyski And Mrs. Torres In Life-Threatening Condition The former coach of the Torres bros. is in really, really bad shape, but it looks like their mom will survive. Ed's wife was also in the car. Post your support on the thread below. LRC The Week That Was This week in our weekly recap we give praise to Jerry Schumacher's boys and US women's 800 runners but have to heap scorn on Canada for totally screwing Nate Brannen (good news: Athletics Canada DOES accept mile conversions - we were wrong) and some on the US men's 800 meter runners. Along the way, we give you a math lesson, remind you that Kenyans are people, too and try to get to the bottom of the Kenyan 10k controversy by actually making calls across the globe. Plus of course we don't forget the incredible action in Paris: Willard's 800m win, Bolt's run in the rain and Bekele over Lagat.